Bring the water to boil in a small saucepan. Add the fennel seeds, cardamom and cloves, cover, and remove from the heat. Set aside for ten minutes. Place the raisins, almonds, pistachios and melon seeds, sunflower seeds, or pine nuts in a bowl and add fennel tea. Cover and set aside for at least 1 hour. Transfer it to a blender, cover, and blend until the nuts & spices are reduced to a smooth texture. Pour into a strainer and set over a bowl. When some of liquid had drained through the sieve, gather the corners and squeeze tightly to extract the maximum liquid. Heat 2 tblsp of milk and add saffron. 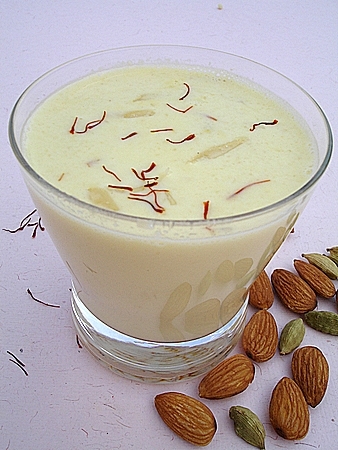 Combine the nut milk, saffron milk and remaining milk in a large jug and chill well. Serve over a crushed ice.